Bedding Distributor Bucket - Reach It! - Move It! - Crush It! The new bedding distributor bucket is intended for distribution of different types of beddings in cowhouses, poultry farms etc. 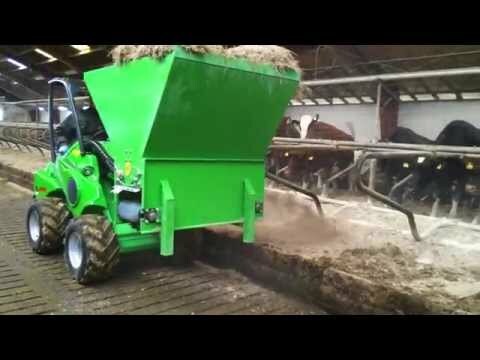 The bucket is equipped with a 300 mm wide belt, which allows distribution of chopped straw, sawdust, peat, bark, wood shavings, sand and lime. Belt speed is steplessly adjustable. The bucket is equipped with a mixing shaft which distributes the material evenly on the belt. Discharge to the left or to the right. Rubber scraper blade, destined for cleaning the floor grates, is available as an option. It mounts under the bucket.